We have family visiting from Minnesota. My husband’s sister, her husband, son and daughter are here, not missing the heat they left behind one bit. You might remember Laura from last spring. She’s the niece I talked about who had to spend some time in the hospital. I sent her the Forever Fabric Flowers and the Buttercup Bag. She’s up and around now, making her recovery and also making gorgeous beaded necklaces. I was the lucky recipient of one in red, mustard and a little orange. I’ve been trying to decide all week what I wanted to make for her. My nephew, Kristian, was easy…he’s a photographer! Needless to say, he got a lens cap pocket with a pocket for his extra memory card. 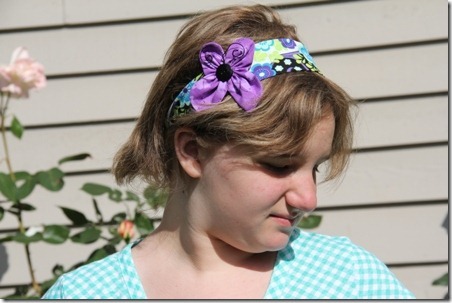 Laura has thick hair that I’m completely envious of, so I decided on a headband. I’ve made this one from JezzePrints before. I really like how it lays and that you can put it on without dragging it over your hair. But I thought this one could use a little something extra, so I added a butterfly. If you’d like to make this little guy, you’ll need this pattern. Cut one on the fold of your desired fabric, so it opens out to look like this. Fold right sides together, leaving the ends open. Clip the corners. Turn one end to the inside 1/4” and press. Feed the other end inside that one, creating a circular shape. Stitch through all layers along edge of fold. Hand stitch with fairly long stitches along the straight edge. Pull thread to gather. Knot to hold, but don’t cut the thread. Stitch up the center between the two small wings. Pull to gather. Knot to hold and clip thread. Cut a 6” piece of wire. Bend at the center and feed through the hold at the center. Twist at the top of the butterfly, then curl the ends with a pair of needle nose pliers. 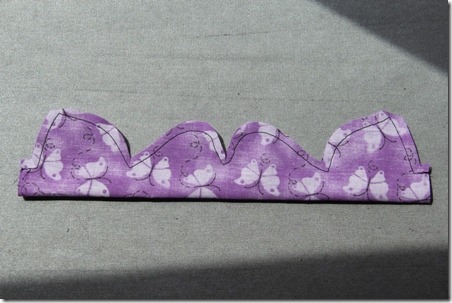 Sew the butterfly to the headband, stitching a button over the center. Our week went by way too fast, and they go home tomorrow. It was a fun week, and hopefully Kristian and Laura will enjoy their new stuff. I know I’ll continue to choose what I’m going to wear every day based on whether it matches my new necklace!